Here is the second post about my new road bike, the Merida Scultura 5000! In the previous post about the bike I wrote about the first impressions that I got from the bike. After spending more time with the bike, I have started to look more in-depth into every part of the bike and found more interesting highlights. Under the left chainstay there are actually 2 screw bosses that are currently covered with 2 bolts. These screw bosses are actually meant for mounting the Shimano Di2 battery, if you want to convert the bike to an electronic shifting setup. 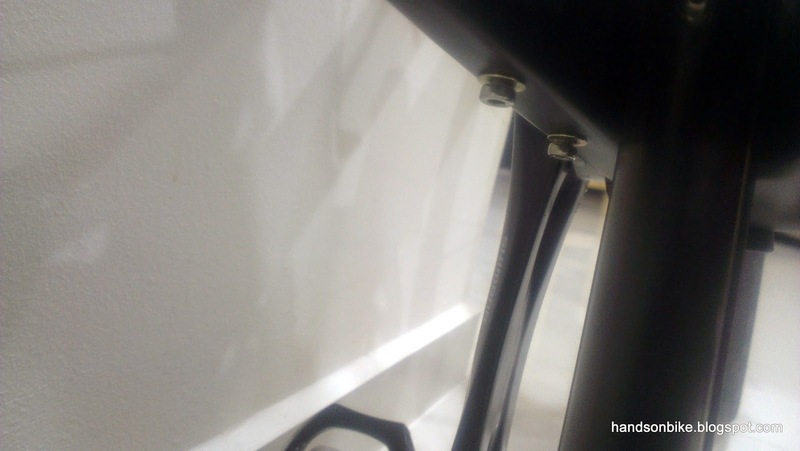 You can see how the Di2 battery mount is fixed to the frame using 2 M4 bolts at this post here. The 2 M4 bolts located under the left chainstay, near the BB area. This is for the Di2 battery mount. As a full carbon frame, the dropouts are also fully carbon to save weight, as compared to using aluminium insert dropouts on the frame and fork. While cleaning the bike, I also took the chance to get a closer look at the rear hub and cassette. Since the wheels are already off the bike I might as well clean the cassette too. The bike with both wheels removed for some post-rain maintenance. 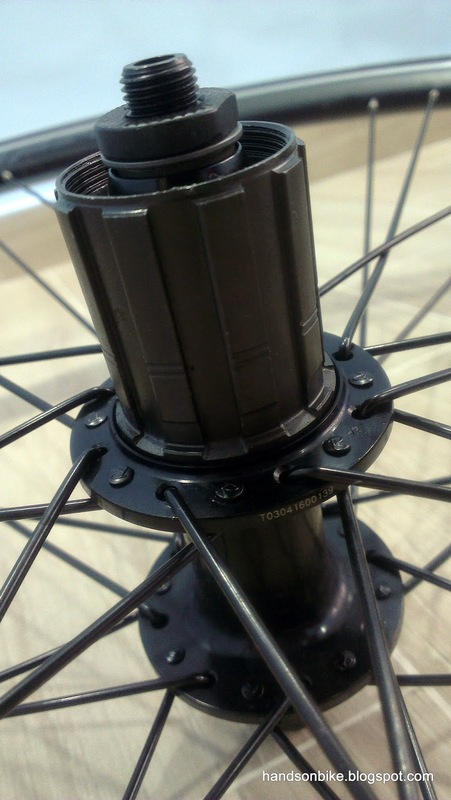 11 speed compatible freehub body. Nothing too special, feels like s standard rear hub that feels rather heavy. Shimano 105 5800 11 speed cassette, 11-28T. 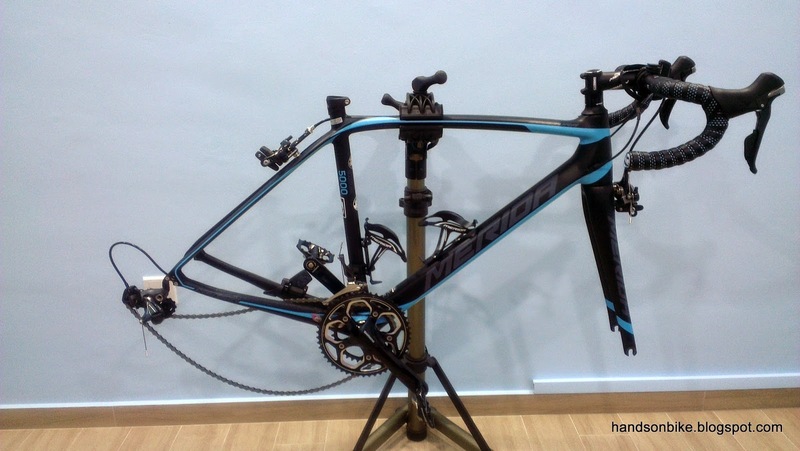 The cassette and chain are of 105 level instead of Ultegra to cut cost and make it possible to reduce the bike price. 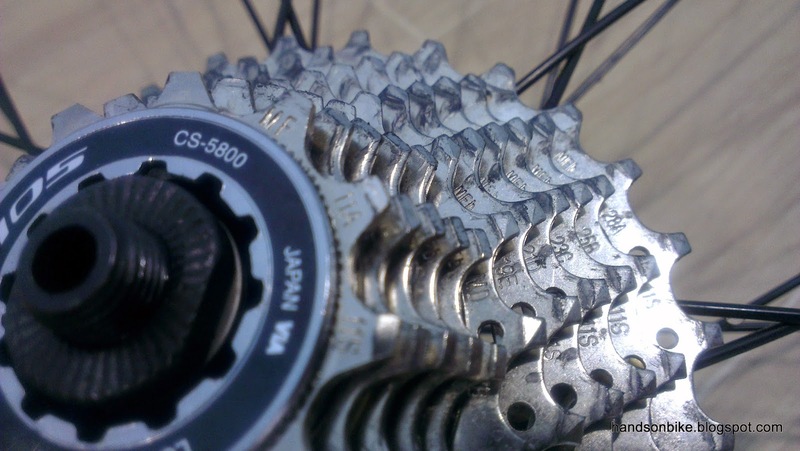 Closer look at the cassette sprockets and the number of teeth on each gear sprocket. 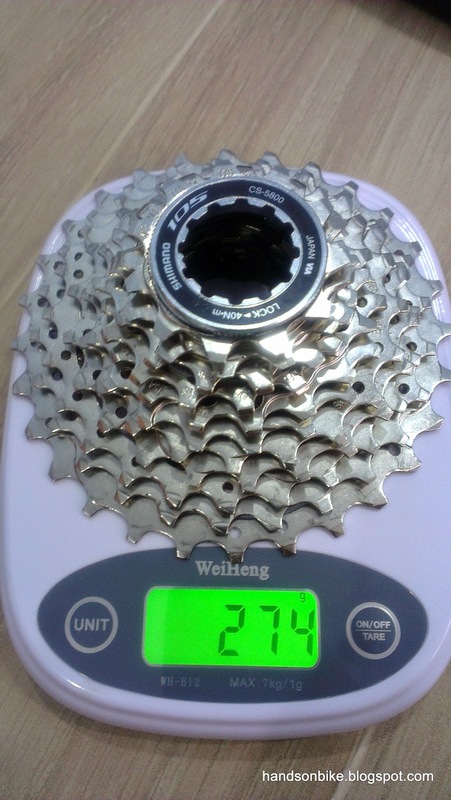 In case you are wondering, the Shimano 105 5800 11 speed cassette in 11-28T weighs 274 grams. 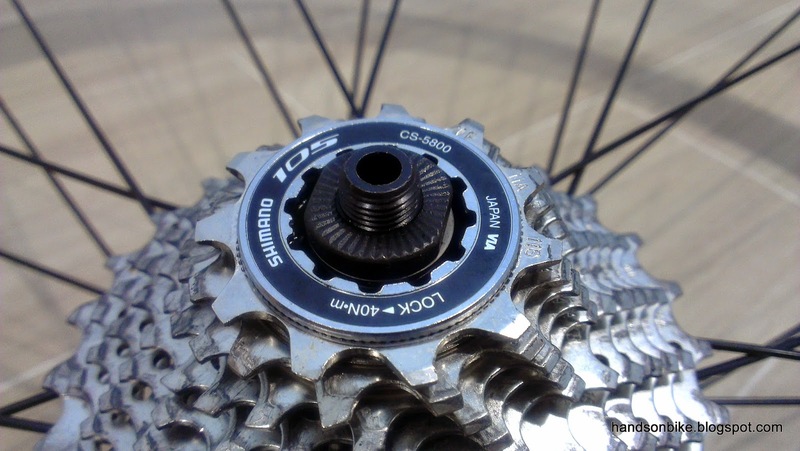 For comparison, the Shimano 105 5700 10 speed cassette in 11-28T weighs 251 grams. Next, let's move on to get a closer look at the seatpost. The stock seatpost is actually a nice carbon seatpost that looks pretty expensive. How heavy does it weigh? Let's find out. Small diameter of 27.2mm allows some flex that improves comfort. After pulling out the seat post, I realised that the seat post is actually very long! There is a minimum insert length of about 10cm. Even if I cut off 10cm from the seatpost, I still have sufficient length to get another 10cm of insert at my saddle height. 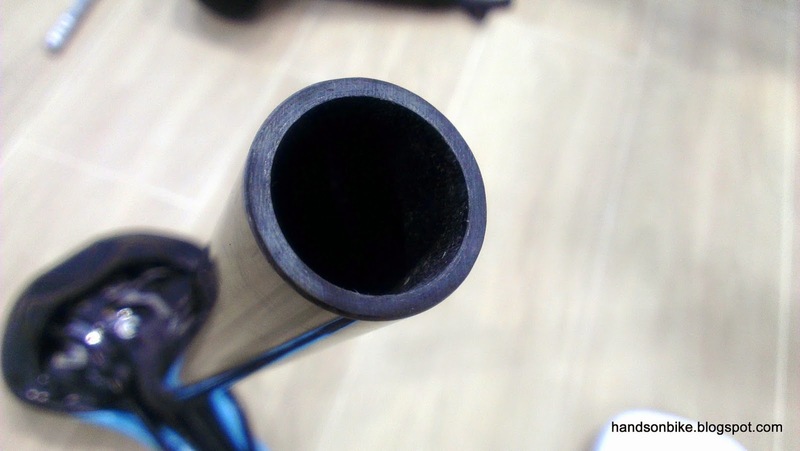 The long seatpost when inserted at the minimum insert length. 10 cm of the seatpost is actually still in the frame. The stock Merida seatpost weighs about 266 grams, which is actually quite low considering the long length, and that it comes stock with the bike. I estimate that if I cut off 10cm from the seatpost, the weight can be reduced by 50 grams. A small difference that is probably negligible. 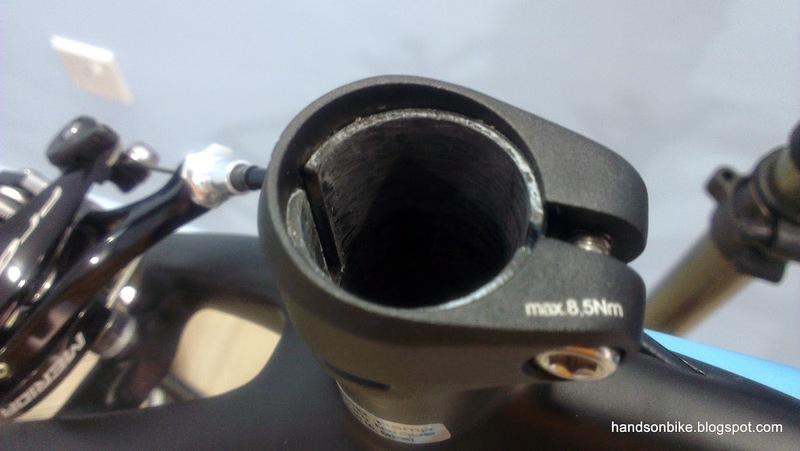 The majority of the weight is actually concentrated in the aluminium clamp at the top of the seatpost. 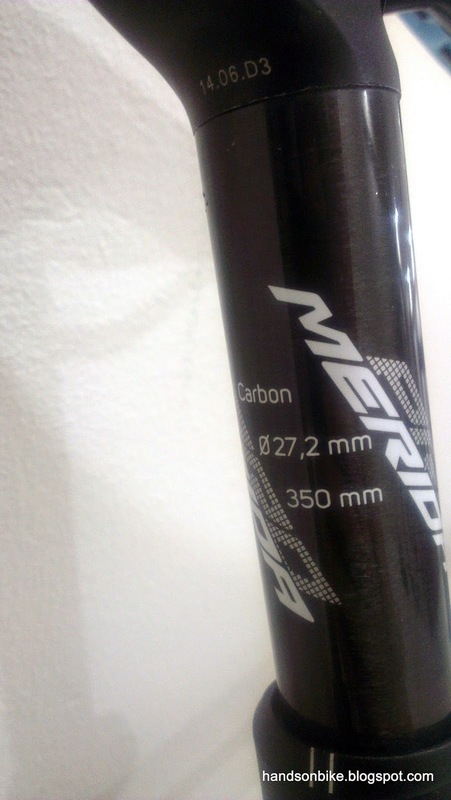 Other carbon seatposts of comparable weight will cost many times more than this stock Merida seatpost. 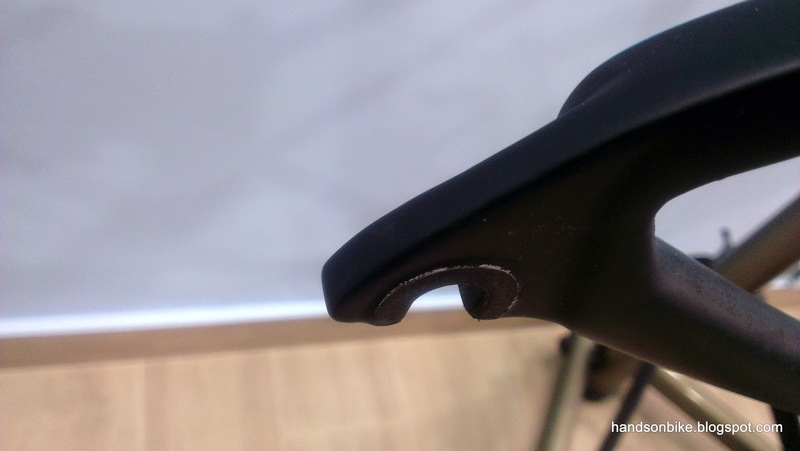 Besides the seatpost, let's take a look at the stock Merida saddle. It is quite a decent looking saddle that has matching colours with the bike frame. 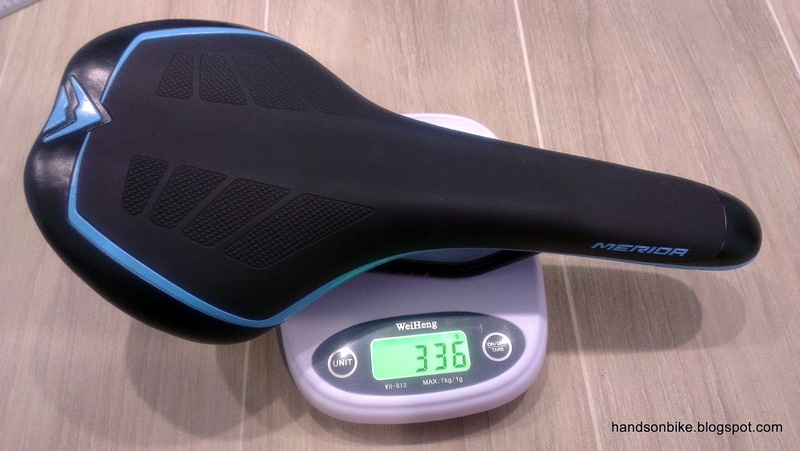 The stock Merida saddle weighs 336 grams, which is considered rather heavy for a road bike saddle. I decided to change the stock Merida saddle to a more familiar saddle, the Selle Italia SLS KIT Carbonio Flow saddle, which I am also using on the Dahon Boardwalk. The appearance looks a little different due to the different printing design, but the saddle is the same. There is also a 100 grams weight saving over the stock Merida saddle. 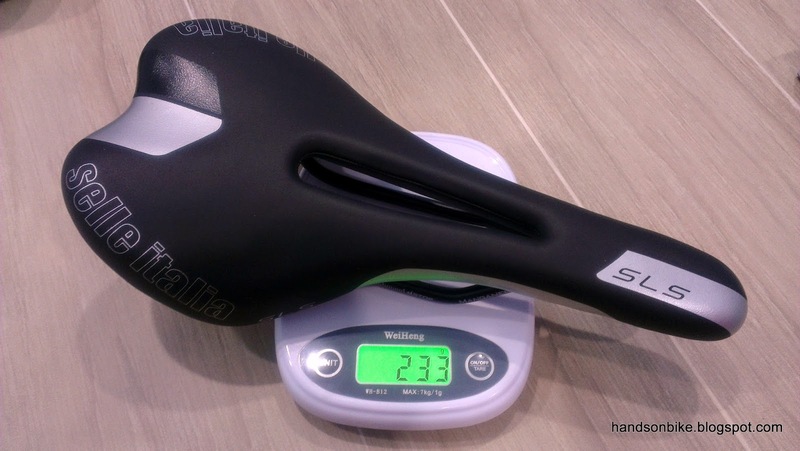 Selle Italia SLS KIT Carbonio Flow saddle, weighing only 233 grams. Saves 100 grams over the stock Merida saddle. The 2 saddles side by side. The Merida saddle is longer and also wider. 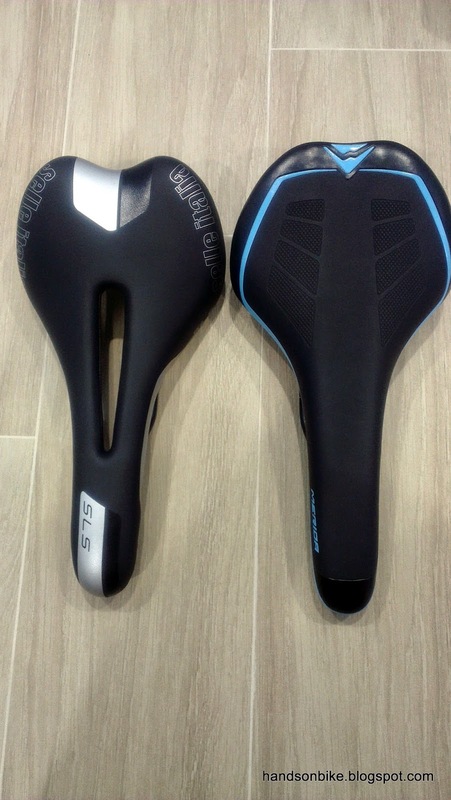 The Selle Italia saddle has a cutout in the middle which definitely contributes to the weight difference. Another part of the bike which I weighed is the bottle cage. There are actually two bottle cages on the bike which were given free with the purchase of this bike. 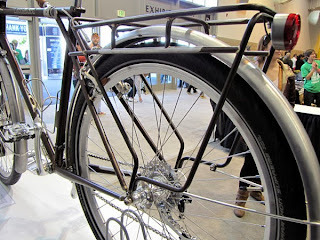 These are nice alloy bottle cages which fits very well visually with the rest of the bike frame. A pair of Merida water bottle cages! It would be perfect if the white Merida logo was in sky blue colour instead to match the frame colour perfectly. 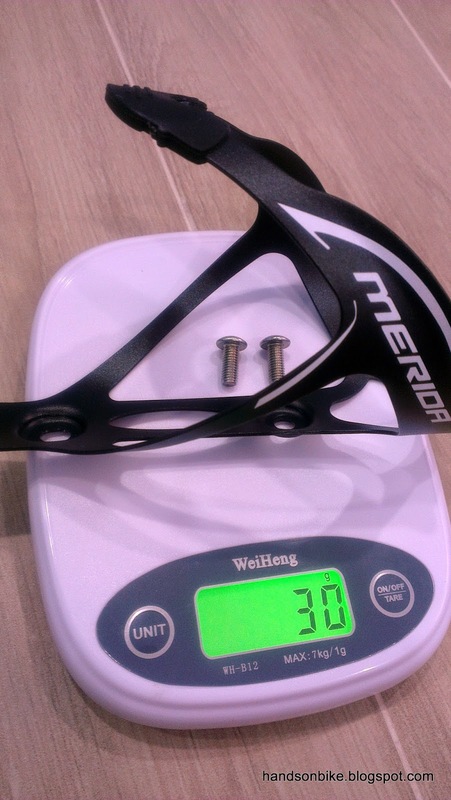 Weight of the alloy Merida bottle cage is only 30 grams. This is of similar weight to carbon bottle cages that cost many times more than this. 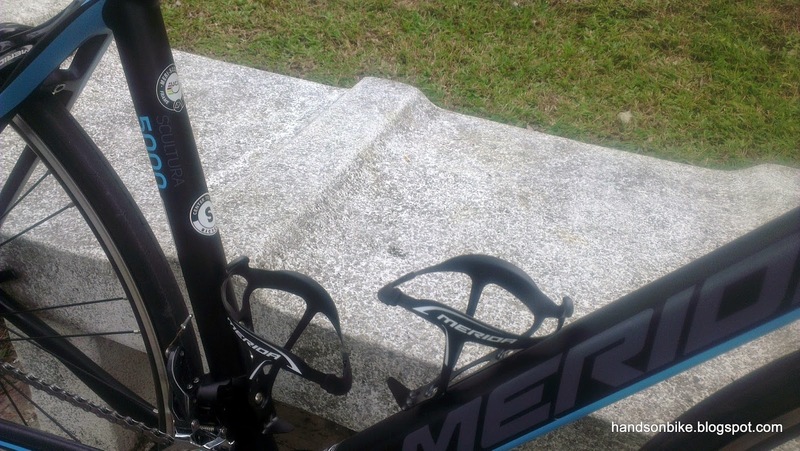 I was also curious about the weight of other stock Merida parts, such as the stem and the handlebars, so I did some research to find out the weight. It was too troublesome to remove everything from the stem and handlebars to weigh them. 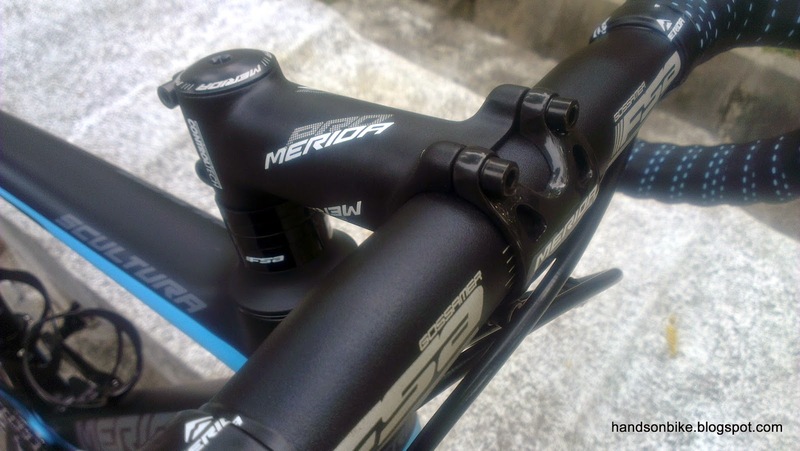 The Merida stem that comes with a carbon faceplate. How much does it weigh? 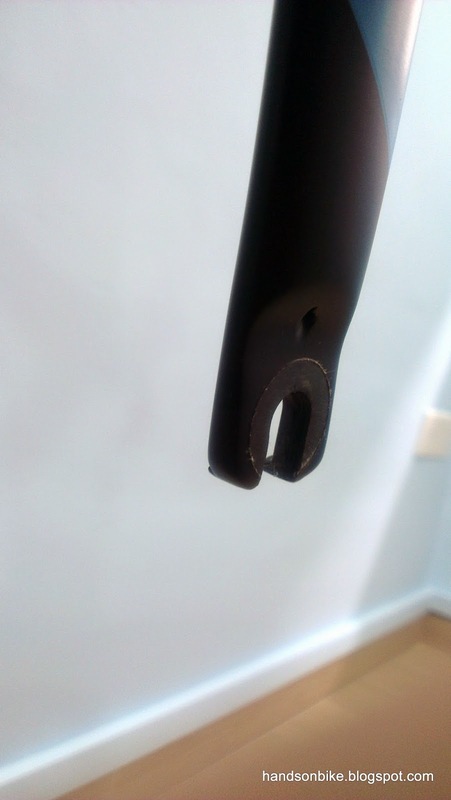 I found this stem on Taobao that looks very similar to the one on my bike. It also has a carbon faceplate. 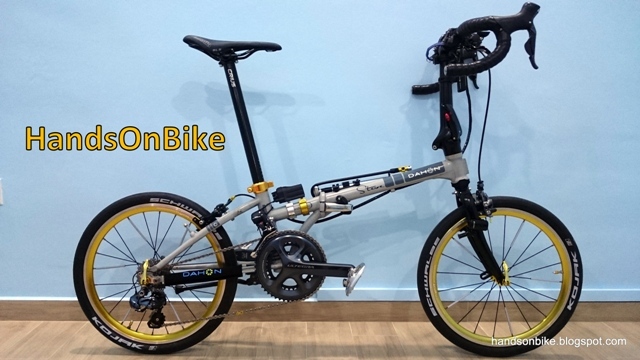 The stated weight is 132 grams for a 110mm stem. Since my stem is a 100mm stem (I think), it will weigh slightly less than 130 grams. This is an excellent weight for a stem, regardless of whether it is made of aluminium or carbon. A fantastic piece of stock equipment that is of good quality, giving me no reason to change out the stem at all. I also wanted to check out the weight of the stock handlebar. This is a FSA Gossamer Compact drop bar that is 400mm in width (I checked the spec by removing the faceplate on the stem). According to the FSA website, a 420mm wide drop bar will weigh 310 grams. 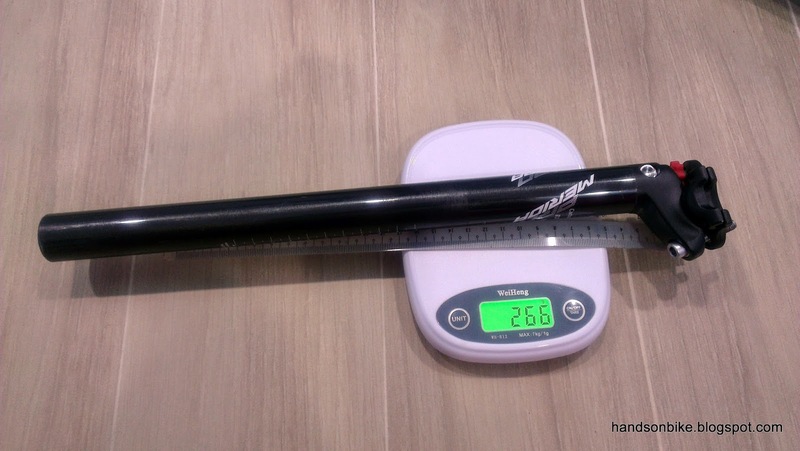 This means that the 400mm wide drop bar that is on my bike will weigh about 300 grams. Not the lightest, but the compact shape is exactly what I like. I had also changed to a FSA compact drop bar on my Dahon Boardwalk, to improve the comfort and reduce the drop distance. 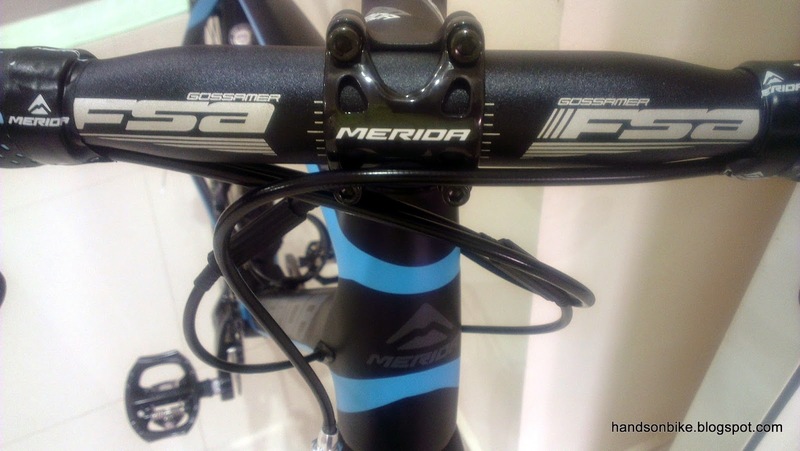 FSA Gossamer Compact drop bar comes stock on the Merida Scultura 5000 road bike. With that, I pretty much know what to upgrade on this bike, and what to leave alone. 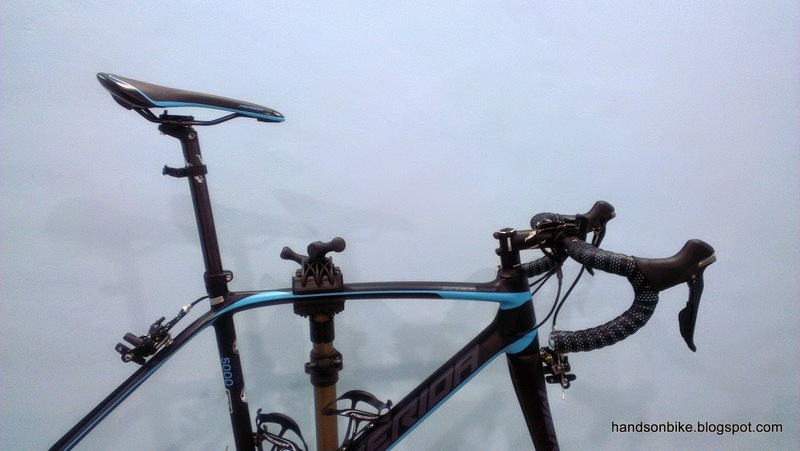 The stem and seatpost are of good quality and it is probably not worth changing them just to save a few grams. The handlebar is slightly heavier than comparable carbon drop bars, but the compact shape is nice and I will probably keep it. The saddle has already been changed to save 100 grams and improve comfort (the stock saddle's nose was too long and keeps catching the back of my cycling pants when I start off). The weight weenie in me has somehow re-surfaced after I got this road bike. There are other upgrades that are lined up, and will be revealed after I make the changes. These upcoming upgrades are pretty interesting and will definitely cut more weight off the bike. Find out soon! For some upgrades and for saving weight, Soul wheels (it seems to be a local company) could be worth looking into. Their aluminum rims come at about 1.1+ kg onward for Soul 2.0 wheels. Not sure about the crankset but FSA, SRAM and Campy has their carbon ones that are pretty nice. Pedals ; Shimano A600s are one of the lightests for SPD standard shoes. Thanks for the heads up about the Soul wheelset, they are really lightweight! This post brings up the weight weenie in me as well. For the lightest brakes that you can find, you can either google for Planet X and / or KCNC. Planet X seems to have the better reviews on the net, but I could be biased. For your (and others) info. in comparison, Campagnolo Super Record brakes tip the scales at 260+. They seem to be single pivot but some decent brake pads might do as well. And the CNC version looks pretty cool too. Really enjoy your post especially the Broadwalk upgrades. I too plannig to get a road bike (after 1.5year on foldie). I will probably get the Ride 4000/5000 instead but i have yet to check it out at local bike shop. I asked about the Merida Ride series at Hup Leong, which is the local distributor for Merida bikes. They don't bring in the Ride series of bikes, which is why I got the Scultura. I was actually also considering the Ride 5000. Thanks Steve. Aiseh, i was so looking forward for a more comfortable Ride. Let me visit Bike X and ask about the Ride5K. Not meant to be rude, i saw an ad in togoparts that look very much like ur bike, selling it? Did you get a chance to weigh the stock wheels while you had everything apart? I'd love to know how much they actually weigh. Yup I weighed the wheels, it will be shown in a future post about the wheels. I had a Scultura 5000 2016.
the wheelset really a big bomb on weight. as per now almost every thing changed, left the frame and fork. I aiming to hit 7 and below of the weight but I am a shimano fans so very hard unless I go into sram or campy.